Chondrocytes toward the shaft (diaphysis) undergo hypertrophy and apoptosis as they mineralize the surrounding matrix. 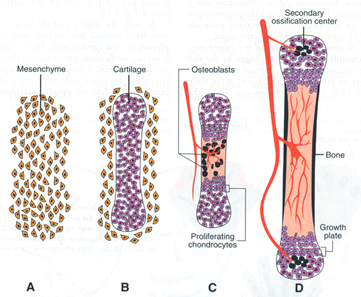 Growth of the long bones continues into early adulthood and is maintained by FGF-dependent proliferation of chondrocytes in the growth plates (long bones have two growth plates, in smaller bones (phalanges), there is only one at the tip). A. 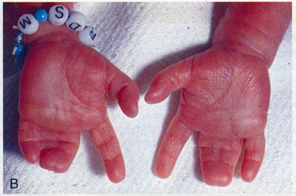 Much of the initial growth and patterning of the limbs occurs during weeks 4 – 8. Limb buds appear at about 4 weeks and much of the basic structures of the limbs (bones and muscle groups) are established by 8 weeks. After 8 weeks, the limb elements then just increase in size. C. Patterning, growth, and maturation of the limbs occurs along proximal-distal, anterior (rostral)-posterior (caudal), and dorsal-ventral axes. Because of all of the complexity, limb defects are among the most common of all birth defects with an overall incidence of 1:200 of all live births. Limb outgrowth initiated by the apical ectodermal ridge (AER) at the tip of the limb buds and proceeds from proximal (i.e. shoulder or hip) to distal (i.e. hand or foot); i.e. proximal elements (humerus/femur) are formed prior to distal elements (ulna/tibia). Proximo-distal patterning of the limb elements is also dependent on HOX genes to specify each of the elements (e.g. HOX11A,D specifies radius and ulna whereas HOX12A,D specifies carpals). Disruption of HOX genes (via mutation or teratogens such as retinoic acid or ethanol) will therefore result in the loss of specific limb elements. Ventral (BMPs and Engrailed-1) and dorsal (Wnt7) signaling factors are antagonistic and this is what sets up the AER specifically at the tip of the limb bud, so disruption of D-V signals will not only affect D-V patterning, but can also affect proximo-distal growth as well. 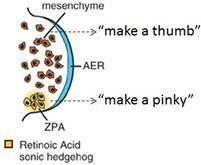 A-P patterning is established by the Zone of Polarizing Activity (ZPA) on the posterior side of the limb (i.e. the little finger side). Shh signaling from the ZPA specifically signals the formation of posterior elements. Signaling from the ZPA also essential for maintaining the AER, so disruption of the ZPA often results in dysregulation of limb growth (too long if ZPA signals are upregulated; too short if ZPA signaling is lost). Development proceeds such that posterior elements (e.g. little finger/ulna) are formed prior to anterior elements (e.g. radius/thumb). Therefore, disruption of A-P patterning and growth can also result in the loss of anterior elements (e.g. loss of the radius and/or thumb). Apoptosis of interdigital tissue is dependent on BMP signaling within the interdigital tissue under the influence of Shh from the ZPA. Disruption of this process can therefore result in syndactyly, and, not surprisingly, most often affects digits 3, 4, and/or 5. Somite gives rise to sclerotome, which develops into vertebral and rib bones; myotome, which develops into muscle, and dermatome, which develops into dermal connective tissue. Primaxial myotome: population of myoblasts adjacent to neural tube (i.e. 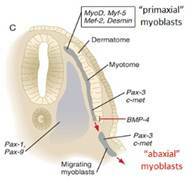 closer to the “axis,” hence the term “primaxial”) and affected by signaling factors from the neural tube to generate muscle precursors with limited migratory potential. 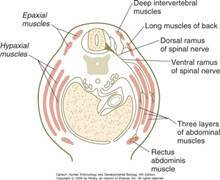 These less migratory cells give rise to epaxial muscles of the back as well as proximal hypaxial muscles of the body wall (prevetebrals, intercostals), “strap muscles” (scalenes and geniohyoid) and proximal limb girdle (rhomboids, levator scapulae, and latissimus dorsi). Recall that “epaxial” and “hypaxial” refers to the INNERVATION of muscles (epaxial innervated by DORSAL rami, hypaxial by VENTRAL rami). Abaxial myotome: ventrolateral myoblasts that are farther away from the neural tube and respond instead to signals from the adjacent lateral plate mesoderm and ectoderm to give rise to a migratory population of muscle precursors that stream out into the body wall and limbs. D. lateral plate mesoderm tissue. A. WNT signals from the neural tube. B. FGFs from the Apical Ectodermal Ridge (AER) of the limb buds. C. SHH from the Zone of Polarizing Activity (ZPA) of the limb buds. D. BMPs in the Ventral Ectoderm of the limb buds. A. failure of neural crest cell migration and/or differentiation. B. loss or disruption of signaling from the Apical Ectodermal Ridge in the developing limb. 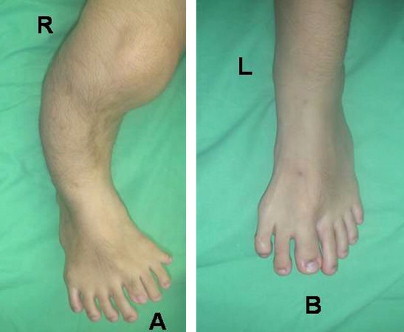 C. loss or disruption of signaling from the Ventral Ectoderm in the developing limb. D. duplication of the Zone of Polarizing Activity in the developing limb. E. loss of the Zone of Polarizing Activity in the developing limb. 5. A 9-month old male infant presents to the orthopedic clinic with the defects shown below. The mother reports having been in excellent health and not taking any medication at any point during her pregnancy, and she similarly denies alcohol and tobacco use either before or during her pregnancy. However, she does mention that she has a cousin and a great aunt who had upper limb defects. Based on the history, you strongly suspect that this family most likely harbors a mutation that results in the loss or disruption of what class of genes? A. abaxial (aka hypaxial) muscle precursors in the ventrolateral region of the myotome. B. primaxial (aka epaxial) muscle precursors in the dorsomedial region of the myotome. C. mesenchymal cells of the lateral plate mesoderm. D. mesenchymal cells of the dermatome. A. during the second week of development. B. during the third week of development. C. during weeks 4-8 of development. D. during the last trimester of development. C. muscles in limb extensor compartments only. D. muscles in limb flexor compartments only.